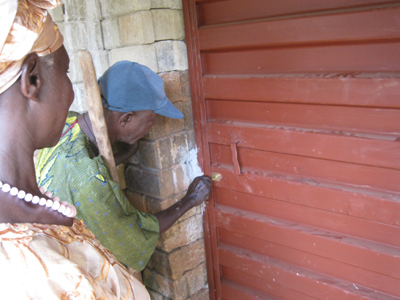 Executive Director Isabel Johnston knew the need for decent housing in her home of Sierra Leone was great, and after directing Habitat for Humanity Uganda for many years, she wanted to make a go of something similar in her homeland. She met Millard and Linda Fuller when she organized a build celebrating the 20,000th house Habitat built in Africa and was inspired. “I vowed that I would bring Millard’s vision and mission to my land, the land that I love, Sierra Leone. I empathized with so many people who had lost homes, property and loved ones,” Johnston said. She started putting a program together and in 2008, when David Snell visited Fuller Center Nigeria, she flew to meet him and Fuller Center Sierra Leone was born. 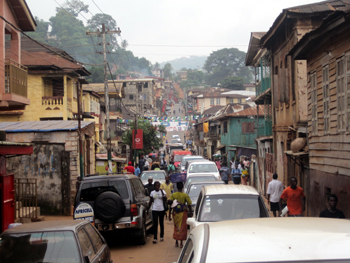 It is located in the capital city, Freetown. More recently, our Director of International Field Operations, Ryan Iafigliola, visited the program. Read about his visit to Sierra Leone here. 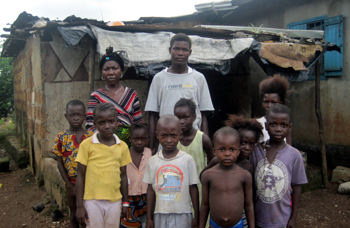 Take a look at The Fuller Center for Housing Sierra Leone brochure. Sierra Leone was once the departure site of the slave trade. Its capital city, Freetown, is where many former slaves were repatriated from London. The country is working toward recovery from an 11-year civil war that ended in 2002. More than half of the country is under the age of 35 and 80 percent of the young people are unemployed. While the economy is growing, life expectancy is decreasing. The war displaced 2 million people, equalling about a third of the population. It also contributed to the HIV/AIDS pandemic that is prevalent in Sierra Leone. Houses will be built with our own soil-cement bricks formed using our brick machine, which was donated by the Methodist church. The houses will represent a transformation from temporary post-war shelters to permanent housing structures, where several generations of families – and often relatives displaced from the war – will live together. Beneficiaries will contribute to the hours of construction time (sweat equity). They will complete a loan repayment, and the homeowner will acquire total possession of the house. We have been given an acre of land in Grafton, a rural area near the capital of Freetown, with a governmental promise to make it 10 acres if we can show adequate, rapid progress upon it. Because of the large extended families of typically 10-15 living within each house, the cost of each is about $5,000. Construction will proceed as quickly as churches, individuals, and others make funding available. View pictures of our work in Sierra Leone. Check out the NY Times Topic: Sierra Leone for facts and links to statistics about Sierra Leone.